I’m a little tardy with my November Can Jam entry, but better late then never, ey? November’s ingredient was apples, and there is only one thing I do with apples, and that’s make applesauce. 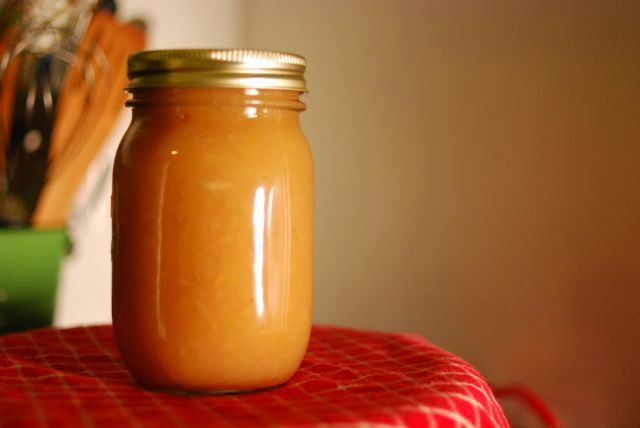 Modified from Ball Complete Book of Home Preserving; Yield: 1 quart, with enough warm applesauce leftover for snacking on. Prepare canner, jars, and lids. Read THIS post if you have no idea what I’m talking about. Place cut apples into a heavy-bottomed pot with about an inch of water. Cover and cook over medium-low until apples are soft. 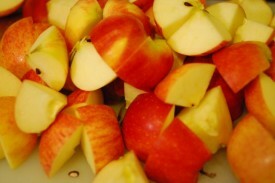 In batches, transfer apples into a food mill. Push through into a bowl. 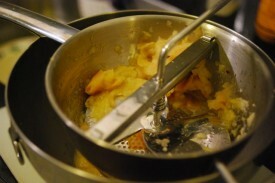 When all apples are pushed through, transfer sauce back into the pot. Add lemon juice, sugar and cinnamon. Sugar and cinnamon can be modified to taste, but the lemon juice cannot. If you don’t know how serious I am in terms of botulism prevention, and how much I DON’T f*ck around with acidity levels, read THIS. Fill jar, leaving 1/2 inch of headspace. Remove bubbles, adjust headspace as needed, place lid, and screw on band just past fingertip tight. Process for 20 minutes in a boiling water canner. Eat straight out of the jar when you need comforting. Note: the title of this blog entry was lifted from Ruth Reichl’s memoir of the same name. Read it if you haven’t yet. Great recipe. Thanks for posting. Apple sauce is practically served at every meal here… I need to learn how to make my own! Looks wonderful! Applesauce has such great food sensory! Apples are my favorite! This applesauce can go a long way. I can already imagine it tasting great with pancakes or steaks. Apple sauce and steak is my favorite combination. I need to start making batches with this recipe.